Muhammed Diya’ went into the police station near his home in Menzel Bouzelfa (southeast of Tunis) then in a rush came back out, poured gasoline over himself from the container he’d left between two cars in front of the station, and set himself afire. Flames engulfed him, and thus, on Sept. 5, 2018, Mohammed Diya’ became a victim of the border security measure “S17”. In a three-month investigation, Diya’ was one of 11 cases documented. Reporting revealed that all were victims of a measure that violates the constitutionally granted right of freedom to travel abroad. S17 also has been extended to banning travel between Tunisian cities. Amnesty International looked at 60 cases in a report titled “They Never Tell Me Why: Arbitrary Restrictions on Movement in Tunisia” and reported that a people were banned from travel because of their religious beliefs and practices, their appearance, especially wearing beards or religious clothes, and because of previous convictions. They were banned despite the lack of any evidence linking them to armed groups. This investigation found that journalists and civil rights activists were banned from travel. The measure also affected people for whom there was no reason to be included other than they had received a constitutional pardon or had been a victim of slander or malicious accusations. The Amnesty report further found blackmail, extortion, and harassment by security agencies connected to S17. In Diya’s case, in 2015 he was deported from Italy days after a presidential guard bus exploded Nov. 2, of that year killing a dozen guards. Immediately after he arrived in Tunisia the young, bearded man was transported to “El Gorjani”, headquarters for the National Unit for the Investigation of Terrorist Crimes and held for two weeks. To this day his family has no idea why he was investigated. All they know is that “Hamma’s” life, as his mother lovingly calls him, was changed forever. Diya’ was not prosecuted but he lived the last few years of his life imprisoned under an open sky. At the humble family home in Menzel Bouzelfa in the governorate of Nabeul, the mother, still in mourning clothes, takes out her firstborn’s white prayer dress and cries. والدة محمد ضياء عرب from Inkyfada on Vimeo. Close to 100,000 Tunisians have been subjected to the S17 border measure according to a 2017 report by the Transitional Justice Observatory Network, which includes the Tunisian Order of Lawyers, the Tunisian Association for Human Rights, and Avocats Sans Frontières. That number is in sync with statistics published by the Observatory for Rights and Freedom in Tunis (Observatoire Des Droits Et Libertè) a year earlier, during a campaign using a sample population of 500,000 under the slogan “…Let me live”. The Ministry of Interior called 100,000 an exaggerated number, but offered no alternative figure. It does say, without connecting this to S17, that it has prevented more than 29,450 Tunisians from traveling abroad in order to block their recruitment into conflict zones. Legal rights activist Mustafa Abdulla Al-Kabeer says that the ministry keeps the accurate number under wraps to hide a lack of organization in the agency. He said the numbers rise and change as ministers change, because politics are behind the policy. In front of a multinational crowd of thousands of young people and dignitaries including UN Secretary-General Kofi Annan, Mohammed Al-Kilifi stood on the podium at the “One New World” global forum, Oct. 25, 2017, in Bogota. From under his open blazer you could see his shirt from with the Youth movement against economic reconciliation called Manich Msamah — “I will not forgive”. During a talk about the Tunisian revolution and the role of youth in combating corruption, he told a bitter story speckled with sarcasm that amused the audience. مداخلة محمد الخليفي from Inkyfada on Vimeo. Hamadi, as he is known to his friends and on Facebook, took part in a workshop in March 2017 at a hotel in Sidi Dhrif, near Carthage, where the presidential palace is located. Security personal descended on the hotel, sought out the young man and led him to the national security district of Carthage. He was questioned about previous travel and work with civil society associations. When he was released he realized from conversation between the two policemen escorting him that he had been subjected to the S17 border measure. When a lawyer friend explained it to him he felt what he described as “A paradox that makes you laugh and cry at the same time.” The measure intended to keep people from entering or exiting Tunisia at border points was being enforced on him in the middle of the capital. “Maybe they ran here because the hotel was close to the presidential palace where the president was,”Hamadi speculated. Or maybe his story really started a year ago. On Dec. 1, 2016, Hamadi was arrested in Sfax where he lived before being transferred to the anti-crime squad in El Gorjani. This came about because of a cynical remark he posted on his Facebook page. He deleted it as soon as he realized that some might take it seriously as an offense to President Beji Caid Essebsi and an act of sedition. Immediately he lost his job as an intern at the Truth and Dignity Commission. * The Court of First Instance in Tunis turned the case over to a Sfax court where a verdict has yet to be reached. “It is a strange coincidence to be put on the same list as suspected religious fanatics, when before, I was being cursed and dubbed an infidel by those fanatics after publishing parts of my novel, Escaped,”explained Hamadi. After the “hotel incident” Hamadi was repeatedly detained when trying to travel. In four trips abroad he was asked a barrage of questions about where he was going and why and when was he coming back, how he was paying for the trip and did he pray. Even within Tunisia, he was delayed twice while traveling with a group taxi from Kef Governorate to the capital when he was singled out for a status check. Freedom of movement is a right granted in the second chapter of the 2014 Constitution of the Republic of Tunisia. Subsection 49 asserts that rights and freedoms guaranteed in the Constitution can be regulated for the purposes of public protection, national security, public health, or public ethics, but adds that judicial authorities are to protect rights and liberties against violations. The May 23, 2017, revision of the 1975 passport law set the terms and procedures for banning travel. The law requires that people be notified they have been banned and told why. They have the right to contest it – and a travel ban must be lifted after a maximum of 14 months in all circumstances. On the other hand; the S17 border measure is strictly an order issued by the Ministry of Interior. In a response to the Amnesty International report, the Ministry of Interior defined the order as a “preventative and precautionary security measure relating to the nature of the state of emergency and the war on terrorism.” Laws regulating the state of emergency do not refer to any special procedures for banning people from travel abroad. And the same applies to the laws on terrorism and laws against money laundering of 2015. The S17 border measure is not subject to any judicial oversight, since the Ministry of Interior doesn’t require a court’s verdict or an approval by any legal official to issue a ban. There appears to be no way of knowing if a ban is lifted after 14 months or when the current state of emergency if lifted. It is not clear whether a ban is renewable or, indeed, how it gets lifted. The ministry justifies the measure as part of a “national preventative strategy to combat terrorism” and claims the power to monitor the movements of individuals within the republic including land and sea border points and airports under Chapter 4 paragraph 3 of Order no. 342 for 1975 dated May 30, 1975. 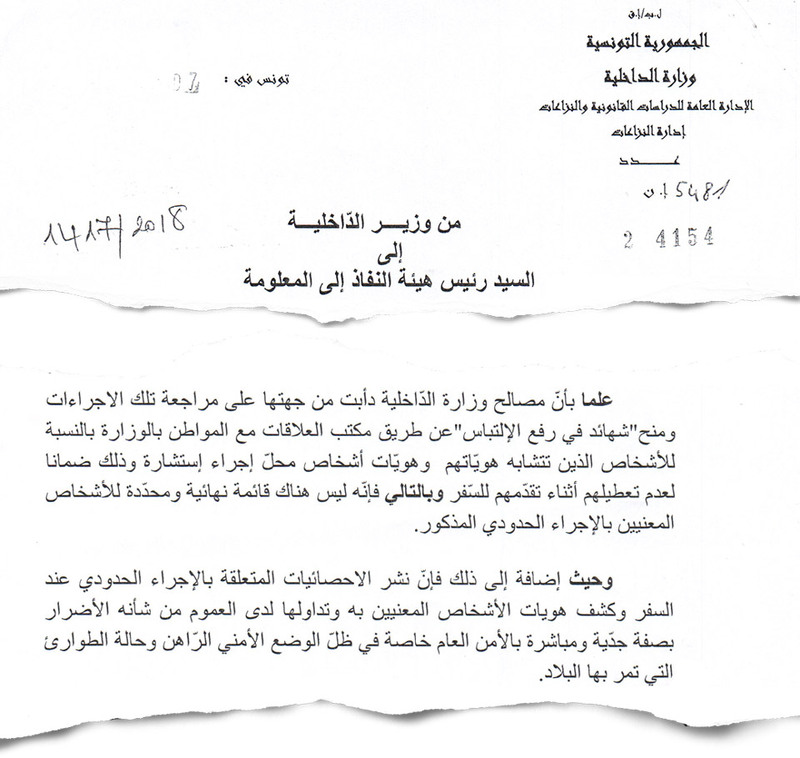 The Ministry of Interior’s justification for putting a citizen under the border measure – taken from the Administrative Court’s decision to suspend execution of S17. القاضي الإداري عماد الغابري from Inkyfada on Vimeo. On a summer night in 2016, Nader Al-Mathlothy, a 29-year-old teacher at a private institute, was walking with friends down Al-Hbib Bu-Rukaya Street, when several policemen stopped him near the “Al Mankala” clock tower for an identification check. Al-Mathlothy handed over his identification card and was shocked by the obvious confusion of the officers who began whispering among themselves. He asked what was going on. Eventually, he was told he was being put under S17 and to come with them to the Setyam police station close to the Ministry of Interior building. For five hours they asked about his religious commitment, his political views, how often he prayed. He speculated that his trouble stemmed from a previous arrest and interrogation after he acted in a rap music video on YouTube and was shown in the background holding a plastic weapon. نادر المثلوثي from Inkyfada on Vimeo. Anis Quertani, general clerk of the Tunisian Carthage airport security union, said border security measures are not new. He admits that S17 is used inside Tunisia between cities and affects not just Tunisia citizens suspected of intending to travel to conflict areas, but also foreigners who might pose a threat to the national security that warrants informing security authorities before they are allowed onto Tunisian soil. Hamadi said he saw the computer screen flash red every time the airport security typed in his name when he travelled. Quertani described some of the technical aspects of how the S17 measure appeared on the screens of airport security. In a reply to the Administrative Court’s correspondence in cases about lifting the S17 measure, the Ministry of Interior confirmed that this measure is “part of the government’s national precautionary security strategy for combating terrorism.” From the court’s ruling dated Sept. 13, 2017, case no. (4101430). 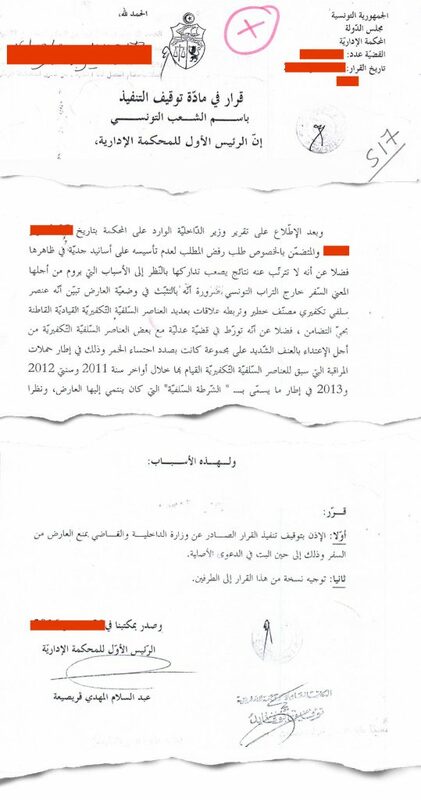 During a hearing in front of the Security and Defense Committee at the Assembly of the Representatives of the People on Jan. 29, 2018, the dismissed former Interior Minister Lotfi Brahem confirmed that more than 29,450 Tunisians have been banned from traveling abroad to prevent them being recruited and transported to conflict areas, without directly mentioning whether the S17 was applied. Between the many examples offered by Quertani, airport employee, and people subjected to S17 measure, plus the Ministry of Interior’s definition of it in is correspondence with the Administrative Court, it seems apparent there is no precise all-encompassing definition of this security measure nor procedure or criteria for applying it. Three women interviewed for this investigation declined to provide testimonials in fear of security scrutiny later. Two were investigated on suspicion of terrorist activities, but were never prosecuted, while the third was subjected to the border measure on suspicion of traveling abroad to work in prostitution. “Women are more guarded than men when describing their experiences, whether charges were related to terrorism of prostitution,”said Marwan Al-Jeddah director of the Observatory for Rights and Freedom in Tunis (Observatoire Des Droits Et Libertè). In addition to the previous reasons, a number of those were subjected to the border measure due to suspicion of being or actual involvement in terrorist activities. This is known as group punishment. This investigation found two families subjugated to the security bans after a daughter-in-law was taken in for a terrorist act for which she is now imprisoned. Restricting movement affects a person’s daily life and limits the ability to earn a living. Diya’, for example, lost his job at a neighborhood factory because a bus he and other factory workers were on was stopped and he was forced off. Amnesty International documented five cases where lives were greatly damaged by the imposed border measure without justification. “….. Of those, three of them made a living by trading across the border, two of them lost their livelihood since they were banned from leaving the country, the third suffered detention, repeated delays, and interrogations when traveling, and interfering in his business. As for the forth S17 measure had a great impact on his work in an airport. The fifth unjustly lost his right to a family life when he was banned from traveling to see his family and take care of his ailing mother.” Taken from Amnesty International report. None of the citizens included in this investigation nor those in the Amnesty report received written confirmation that they have been subjected to this border measure. They did not get an explanation of the reason that led to the action against them. Even though most of those who “discover” that they have been put under his measure contact a lawyer and then send a letter of grievance to the interior minister, the number of people who actually follow through by filing a case with the Administrative Court to halt the execution of the border measure or overturn it is unknown. “It is an implied decision to ban travel not actual one, as such this administration is unable to provide the court with a copy of it”taken form a reply by the Ministry of Interior to the Administrative Court (Aug. 12, 2016, administrative case no. 148694). Hamadi tried to find why he was subjected to S17 border measure, and if it had anything to do with the accusations of verbal assault against the president of the republic and sedition filed against him by going to the Foreigners and Border Control Administration. He and two friends who accompanied him were not allowed to leave. In the city of Monastir, Tariq AL-Dababi, 33, petitioned the Minister of Interior for months to lift the travel ban. He had been arrested in 2015 on suspicion of making contact over the phone with a suspect. National Guard deputies interrogated him then released him after “confirming that Tariq did not make the call but it was another person in the neighbourhood,” according to him. He got no reply. Instead the police visited and told him to stop writing letters. He continued to be stopped whenever he travelled in or out of the city. Because of the measure he could not get a criminal clearance and thus could not report to a new job at the Société Nationale d’Exploitation et de Distribution des Eaux . 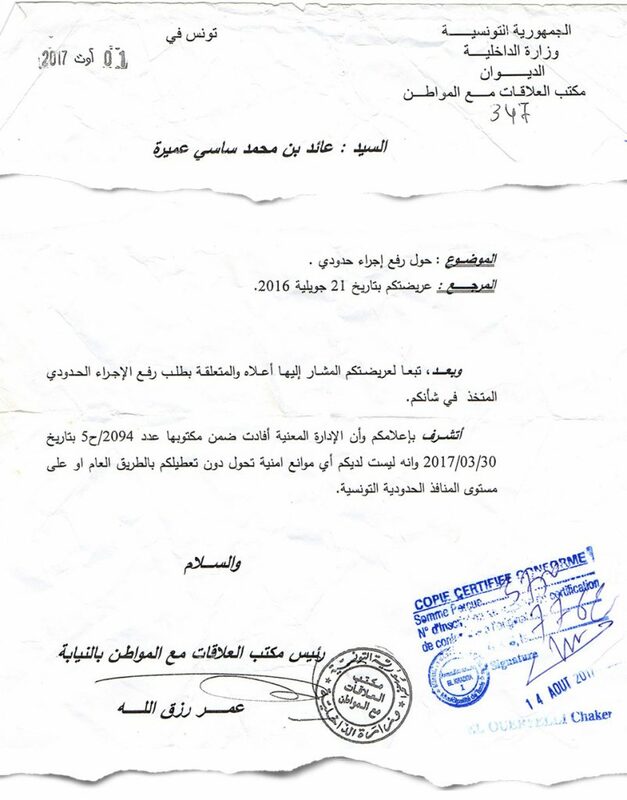 In Ben Gardane, a city on the Libyan border that legal rights activist Mustafa Al-Kabeer speculates may be the area most affect by S17, 35-year-old merchant Al-Hashmi (an alias) has been trying since 2016 to get the ban on him lifted. He petitioned the Ministry of Interior, filed a case with the Administrative Court, and informed the ministry of the judge’s ruling to lift the ban, but to no avail. He is sill unable to work which requires travel into Libya to import goods and moving among neighboring cities to sell them. —Journalist Ayed Amira, journalist under S17 measure. Ayed Amira, a Tunisian journalist working for a international media outlet, was also a victim of S17 unable to easily move between cities and unable to travel abroad at all. Ayed believes the measure might be the result of defamation against him. In custody he’d be asked if he prayed ,and what organizations he works with, and “against whom he writes,” the journalist said. Members of the Rights and Liberties and Public Relations and Security and Defense committees at the Assembly of the Representatives of the People tried in vain to find out why Ayed was banned under S17 . Ater two years Ayed finally succeeded in getting the ban lifted – only after politicians formed the “Al Nahda movement” party and the “Tunis Will” movement intervened on his behalf, he said. 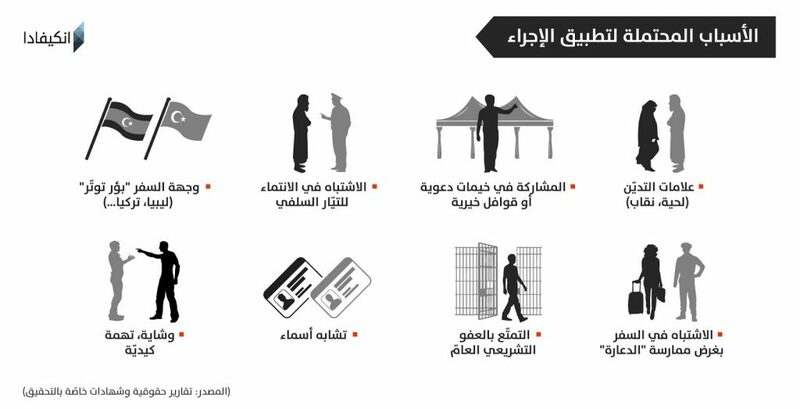 The Citizen’s Relation Bureau provided him, upon his insistence, with a document stating the absence of any “security restrictions” restricting his movements on highways or at Tunisian border points. It made no reference to him ever been subjected to any border measure and it did not specify the department that had subjected him to the security measure. مروان جدة: مدير مرصد الحقوق والحريات from Inkyfada on Vimeo. “I requested earlier that the ministry provide a guide explaining how the S17 measure is added to a citizen’s personal data file, what it permits, and how it may be lifted, but received no answer,” said Imed Daïmi , Assembly representative of the people and rapporteur of the Rights and Liberties and Foreign Relations Committee. He adds “The information we have tells us that it is very easy to add new information to any Tunisian citizen’s file by security officers or police members, but deleting it requires an action by the central ministry…… The absence of a clear guide on the mode of execution of the S17 measure making its application dependent on the judgment of security personal… and undoubtably opens the door to corruption,” he said. “We have confirmed information about security members who exploit this measure to help people (under the measure) issue passports in exchange for money.” Imed Daïmi. عماد الديمي: عضو مجلس نواب الشعب from Inkyfada on Vimeo. 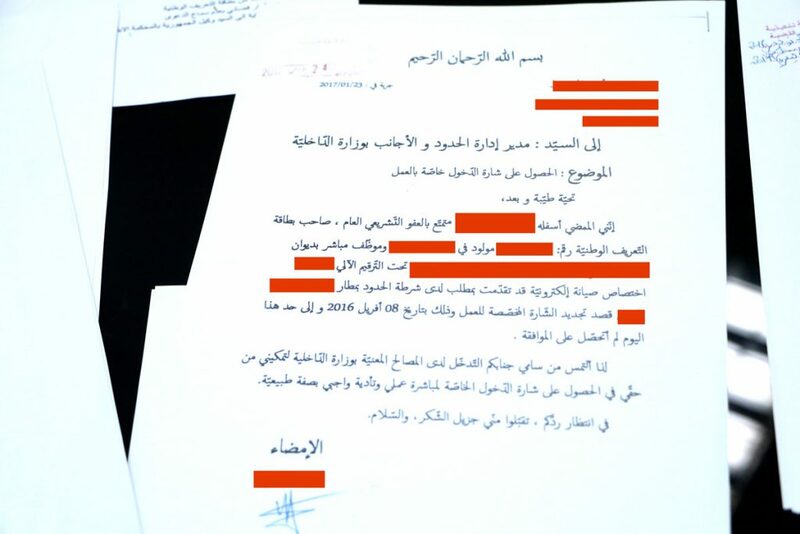 We talked to young Tunisian man who paid about 15,000 dinars to acquaintances and employees at the Ministry of Interior to get an S17 ban imposed on him in 2014 lifted. His name and the names of the people he paid are being withheld to protect him. He was hit with the ban on the heels of a case related to terrorism and it kept him from work and study abroad. He said the paperwork to lift the ban took 15 days and, he was on a flight out the next day. شهادة شابّ دفع رشوة لرفع الإجراء 17 from Inkyfada on Vimeo. To secure information and statistics about S17 a request under the Freedom of Information law was submitted to the Ministry of Interior. In violation of that law, employees of the Citizen Relations Bureau at the ministry demanded a journalist’s personal identification card and detailed information on what the information was being used for. The Information Access Authority was asked to intercede. In replies to the authority, both the Administrative Court and the Ministry said the information was being withheld under exemptions allowed in the law for pubic safety and national defense, and personal information. The court said the information request was an interference in judicial procedures. The Ministry further said it had no final and specific list of persons under the S17 measure. The Authority has yet to reach a decision about whether the information must be turned over.The Interior Ministry did not respond to a letter requesting an interview about S17. The reporters FOI request did not seek information on the identities or personal information of anyone, statistics about how many people were involved and where the measure had been implemented. After three years of restrictions Mohammed Diya’ Arab was also in a difficult emotional state. Police officers frequented the family home inquiring after him. Some asked the family for money, his brother said.. Even when Diya’ went to the family estate to take care of the land or do maintenance, members of the National Guards would descend on the place and keep him under observation. He lost his appetite and love for life. İnstead of riding his bike, he stayed in his room reading the Quran. Working with the Sanad program, of the World Organization Against Torture, providing legal, social, psychological, and health aid to the victims of torture and abuse, psychiatrist Reem Ismail has met “a large number of people subject to the S17 measure” over the years. She says her experience is that the measure is “extreme emotional torture” which can result in psychiatric illness. “They all described themselves as prisoners in the shadow of the S17 measure, without being in an actual prison,” she said. “My brother burnt himself alive in front of a police station to send a message to the police that read: There I’ve burnt myself up, so relax… leave me in peace”. This investigation was completed with the support of Arab Reporters for Investigative Journalism (ARIJ) www.arij.netand under the supervision of editor Mohammed Komani.